Abalone Bay Unit 18...Lot 78; TOT ID# 1596 ... 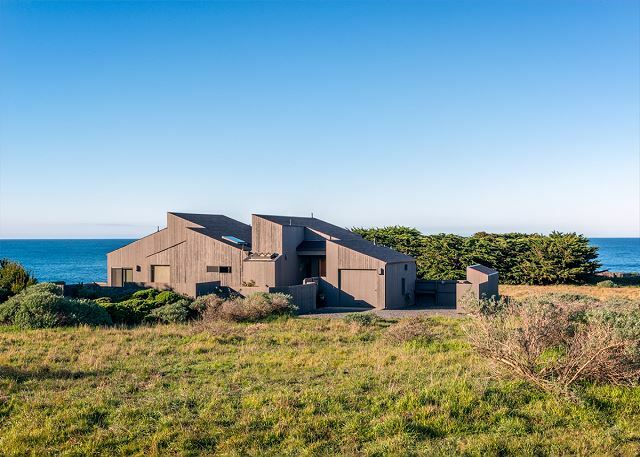 Elegant, Ocean view Sea Ranch Home – and We're Dog-Friendly, Too! 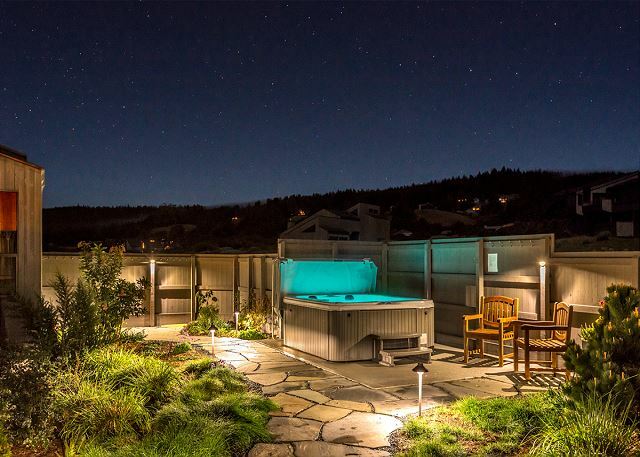 Imagine stepping from the cool night air into the warm bubbles of your private hot tub. A glass of local wine or a mug of craft beer (you pick!) sits beside you – a tasty memoir of your recent jaunt through Sonoma wine country. As you relax into the soothing water, you glance up at the inky sky, where an eruption of constellations twinkles back at you. It's paradise. Welcome. 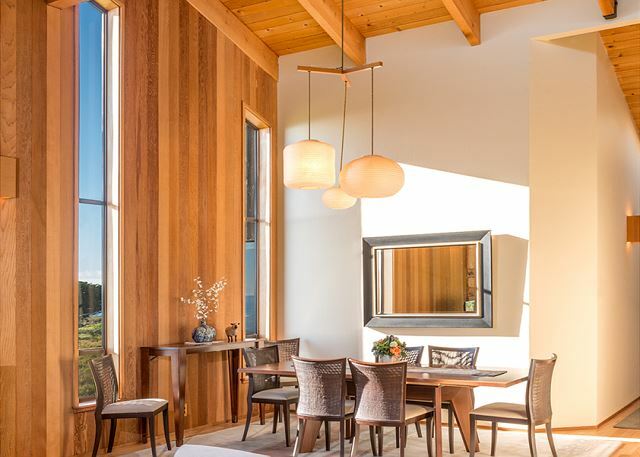 Welcome to an oceanfront retreat perched atop a scenic bluff. 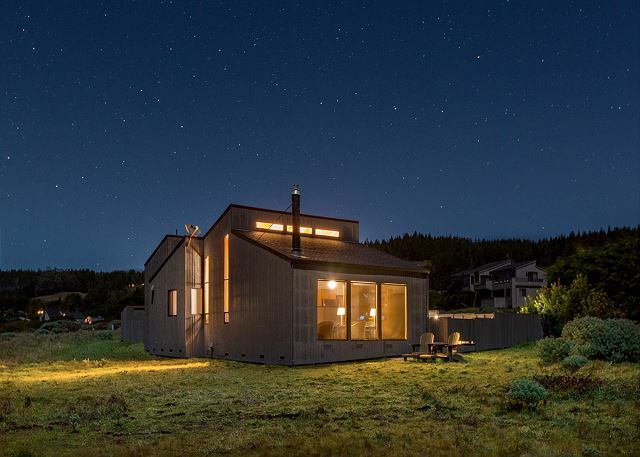 Welcome to a place where whales breech in the bay, deer eat out of your hand, and seals sun themselves on rocks – to a cozy retreat just a short drive from the gastronomic delights of Mendonoma (Sonoma/Mendocino) and the bustle of San Francisco. 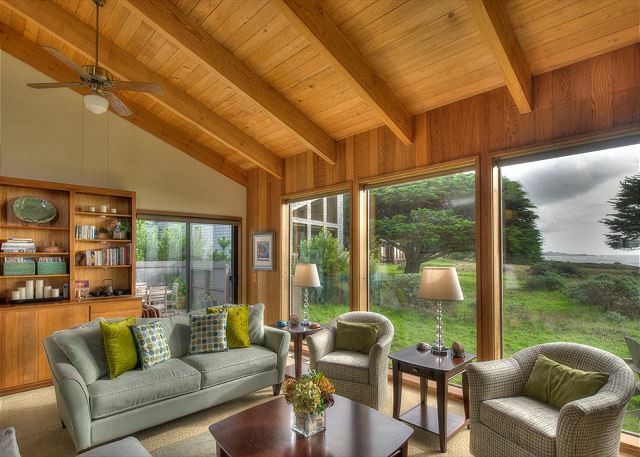 Welcome to your dog-friendly home-away-from home in lovely Sea Ranch, California. Welcome to Abalone Bay. 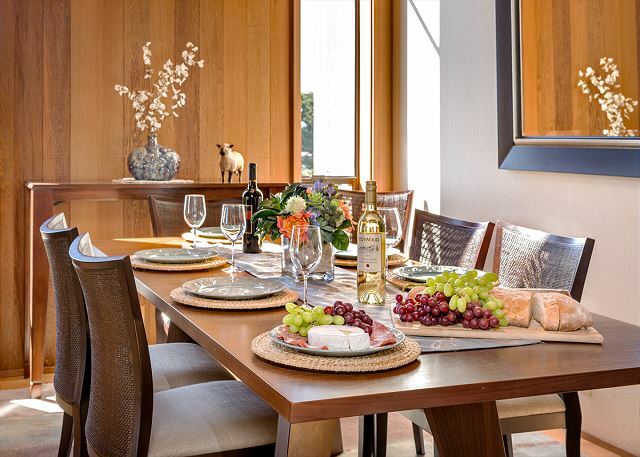 Abalone Bay is both elegant and inviting, seamlessly blending unparalleled ocean views and fine finishes with the comforts of home. Step into our home, and you'll feel instantly at peace as picture windows invite the outside in. 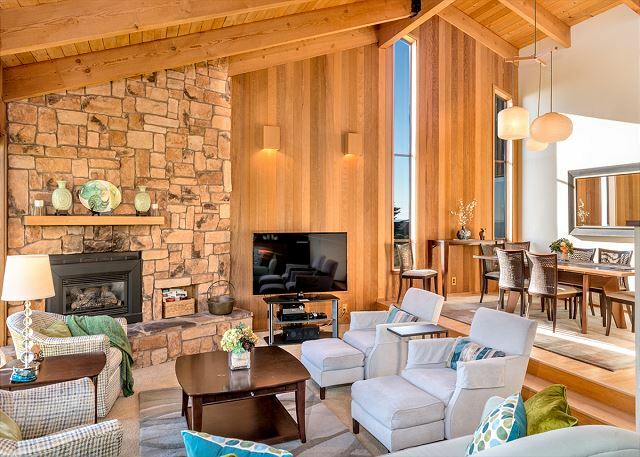 Classic redwood beams meets vaulted ceilings, a gourmet kitchen beckons, Adirondack chairs await on the ocean view terrace, and a private courtyard offers direct access to picturesque bluff trails. Abalone Bay's recently updated décor with new furniture, fine linens, and fresh paint offers a sleek and stylish new look. 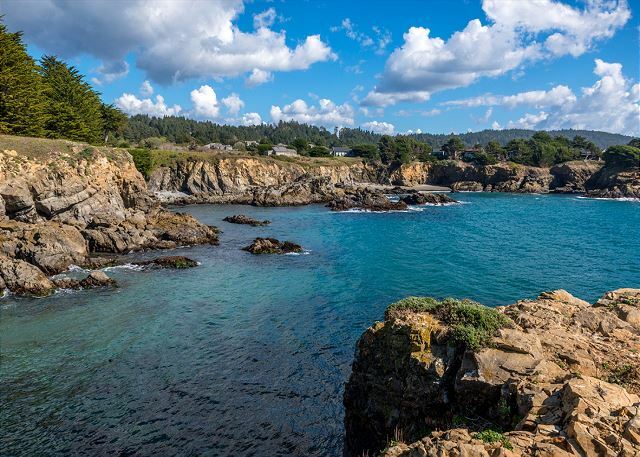 We're just minutes from restaurants, markets and other amenities, but Abalone Bay is a secluded, quiet world of its own. We're perfect for golfers, trekkers, and mountain bikers. 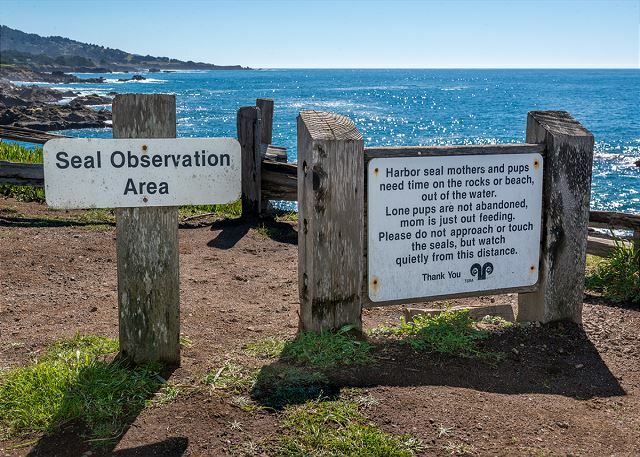 And abalone divers, we're diver-friendly – just a short walk to Sea Ranch's Smugglers Cove (easy staircase access), and not only do we have a wetsuit drying rack, but an abalone cleaning station too! 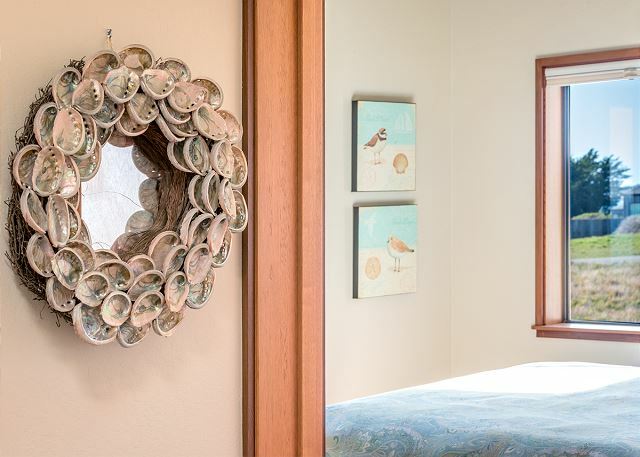 One of our favorite things about Abalone Bay is the quiet and seclusion that surround our home – you can curl up with a good book or play a board game, with only the crashing waves as your soundtrack. 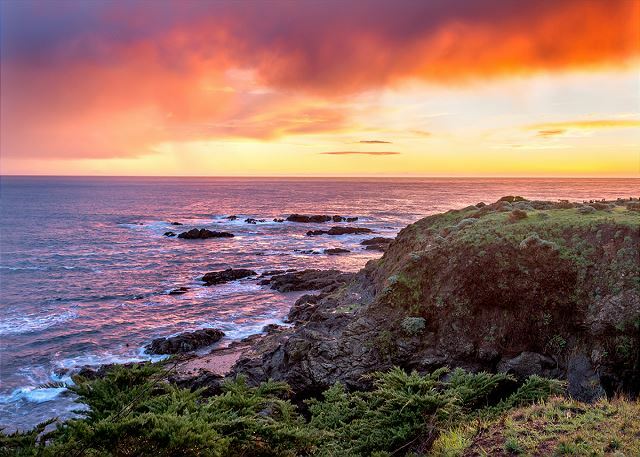 With the scenic Pacific coastline it's the perfect place to relax, unwind and connect with your loved one. 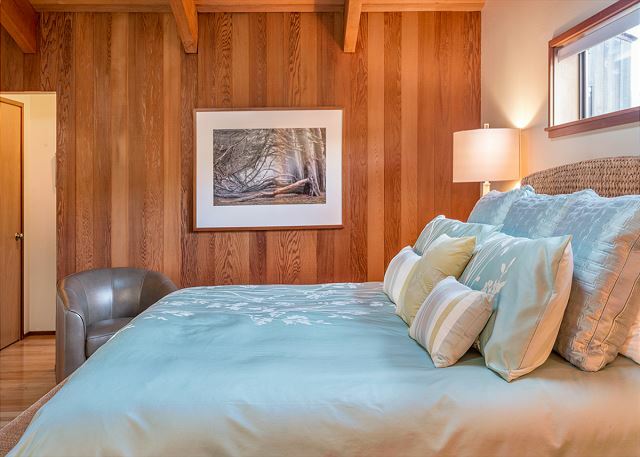 The master bedroom has direct access to the kitchen, perfect for early morning coffee. 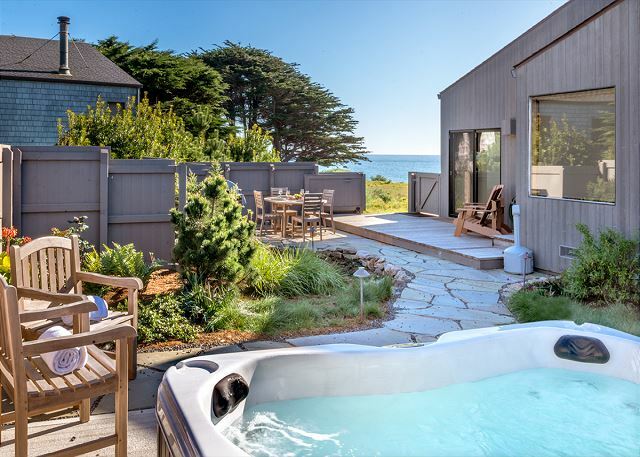 You'll also love relaxing in our hot tub, kicking back on our ocean view Adirondack chairs, watching the sunset, counting the constellations, and walking Sea Ranch's bluff trails. Come, stay and make yourself at home. 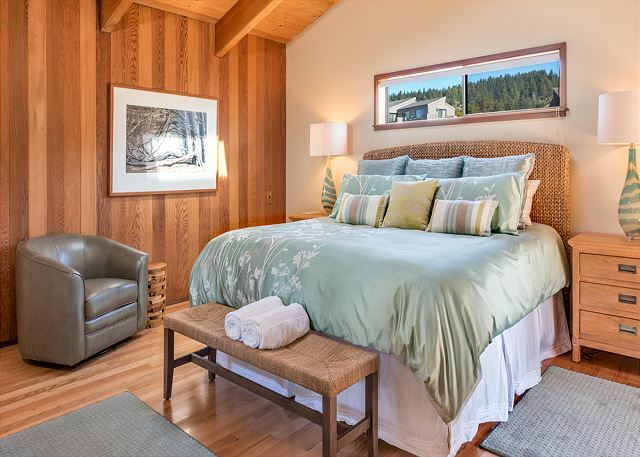 Abalone Bay would love to have you! 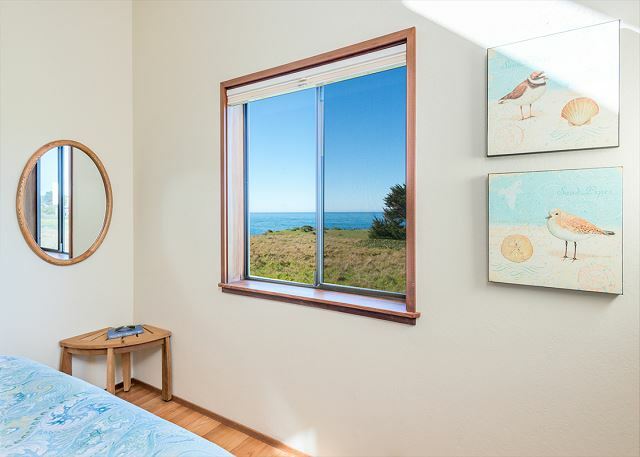 Abalone Bay has one of the best locations at Seascape, right on the bluff with no other houses visible from the main living area, gorgeous ocean views and easy access to the bluff trail. The house was comfortable, well equipped, and clean. The hot tub was warm and waiting and also had great privacy and views of the water. Our family of 6 had a wonderful time in this lovely home. 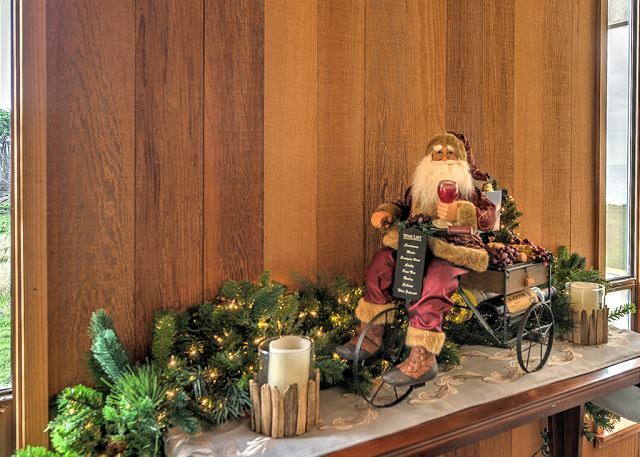 It's obvious the owners have put a lot of thought and care into the house and amenities, and we really loved it. Spent a beautiful, sunny spring week at Abalone Bay in Sea Ranch. The well-equipped house was in a great location for whale watching and walking to beaches. Enjoyed pizza the first night from Upper Crust in Gualala, then cooked the rest of the week. The kitchen had everything we needed, and the owners provided binoculars, games and a special dog basket with toys and other dog items. We enjoyed the courtyard and hot tub every day of our stay. We saw deer, a fox, whales, wild turkeys, herons and seals. 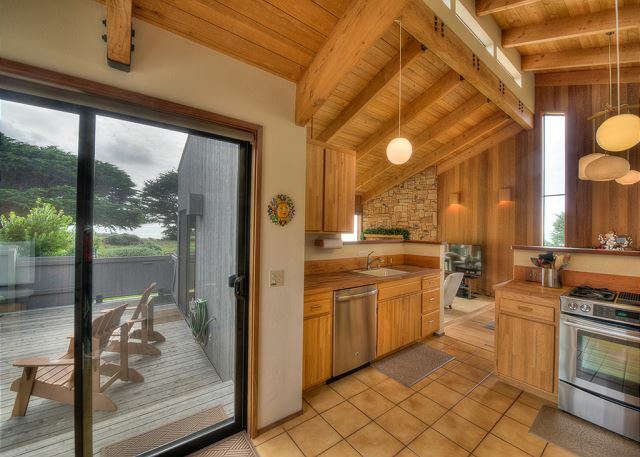 Having stayed at Sea Ranch before, this house was the best so far, clean and well-appointed with great views. Our entire rental experience was great-kudos to the owners and staff at Beach Rentals. We would stay at Abalone Bay again and recommend the house to others. We stayed at Sea Ranch for the beauty, houses, bluff trail and beaches, but also visited the Point Arena Lighthouse, Stornetta bluff trails and the Garcia River Casino in Point Arena. Traveled here with lifelong friends and couldn't have been happier. House is perfect for 6 adults and the location can't be beat!! This was a perfect place for our family of 4 and my parents. It was comfortable, perfect location, and very relaxing. The kitchen was well stocked and had everything we needed. We spent a lot of time just looking out at the ocean, and taking walks. Lovely home! 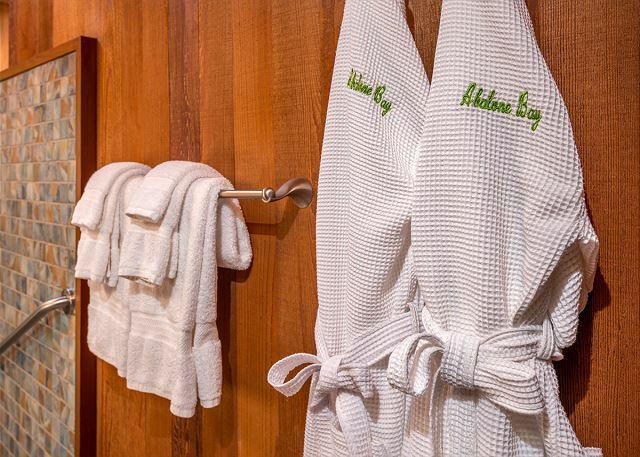 Clean, comfortable, and well appointed. We very much enjoyed our stay and look forward to returning. Thank you for sharing your home. 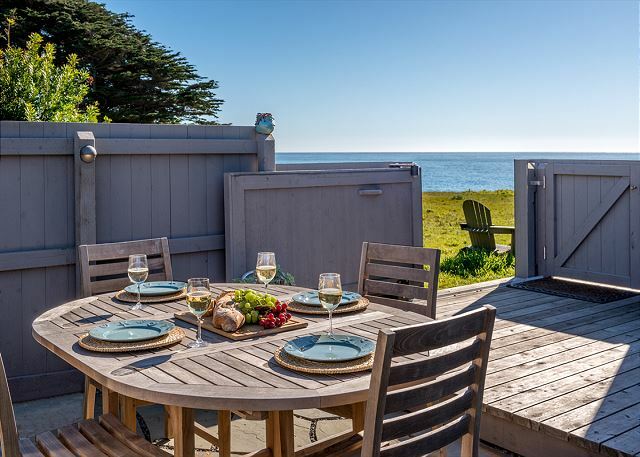 We absolutely loved our stay at Abalone Bay - from the ease of communication with the owner, to the clean and beautiful house which was so very well-appointed, to the absolutely incredible location right on the ocean - it exceeded our expectations in many ways. We particularly loved how dog-friendly it was - there was even a welcome basket for our pooch. I highly recommend this home, and cannot wait to go back! 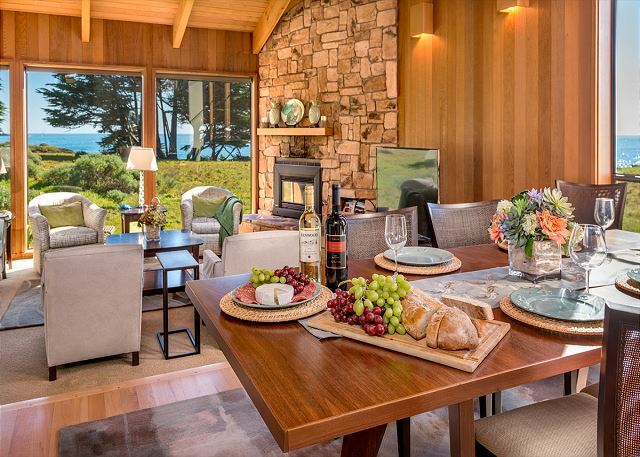 We come back every year to this beautiful home directly on the shoreline of Sea Ranch. Surrounded by wildlife and nature yet with all the comforts of home. It truly is the most perfect place to stay. We love this house; this is our second stay here- we also stayed last October. House is perfectly located and comfortably appointed. All the comforts of home and even more....Yard is perfect for our two small dogs. Very proactive owners. The house was beautiful and well-equipped for our family-- I need to cook a lot as we have 4 children, and everything was there that we needed to have easy meals together. 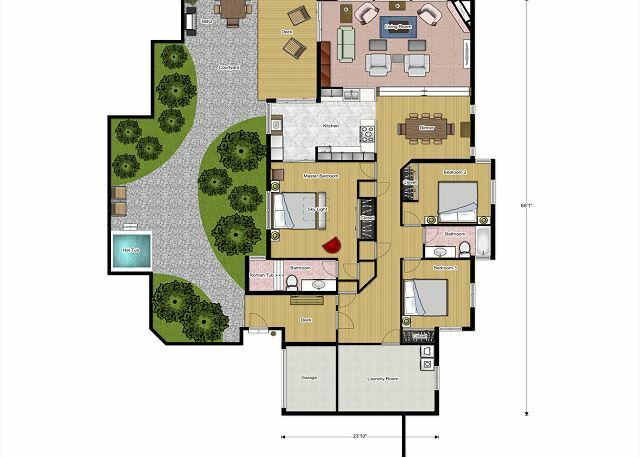 The layout of the house is phenomenal, not to mention the views of the ocean from the bay windows in the living room and the windows in the two smaller bedrooms. 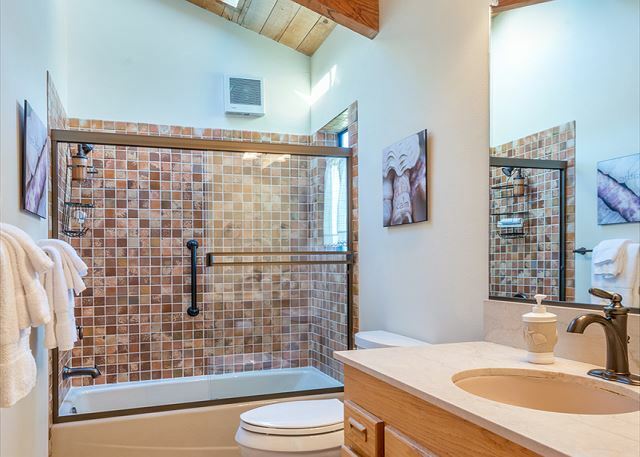 The master bathroom has an amazing shower, and the hot tub was lovely. It was warm enough to enjoy a couple meals outdoors, and again, there was everything well-marked for outside use that made it stress-free. We found a handful of amazing coves and beaches within 10-minute walks of the home, which is really close to the main pool, too. I hope we get to enjoy this property again! The house was beautiful, and being dog-friendly was a huge benefit. The courtyard was well secured so my pet could not get out, and it was beautiful at the same time. The kitchen was well-appointed, the best stocked kitchen of any of the homes we have visited (at least 7 times). The furnishings were lovely, the grill came in handy, and washer/dryer and other amenities would have been very useful had our stay been longer. Had a relaxing and great time. A little more white water scenery would have made it outstanding. Beautiful home, grounds, view, and the OCEAN! We had such a nice long weekend at this house. I went with my two adult children and two dogs. The house was immaculate. I rent a lot of vacation houses and I would put this at the top in terms on cleanliness, tied for first place with only one other home. Nicely decorated, very comfortable. It rained hard during most of the weekend but we were still able to have a fabulous time. LOVE this house. 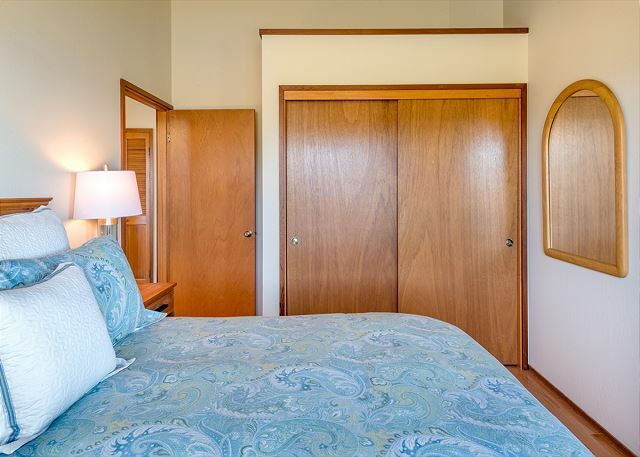 Note, the two guest bedrooms are small and very close together. I think kids (rather than couples) MIGHT be more comfortable in those rooms. Master suite was lovely. Hot tub great. Discovery that Sea Ranch has its own fully stocked dog park was a huge bonus expecially since the weather was bad and the dogs needed to go out and run anyway! Five star weekend. Thank you Beach Rentals, Inc. It was everything you described and more. I have already recommended the house to two friends who saw my pictures and want to go there! What a wonderful, relaxing week in Sea Ranch. So many times when I am booking a vacation home, the condition of the property looks so different from the actual property when we get there. 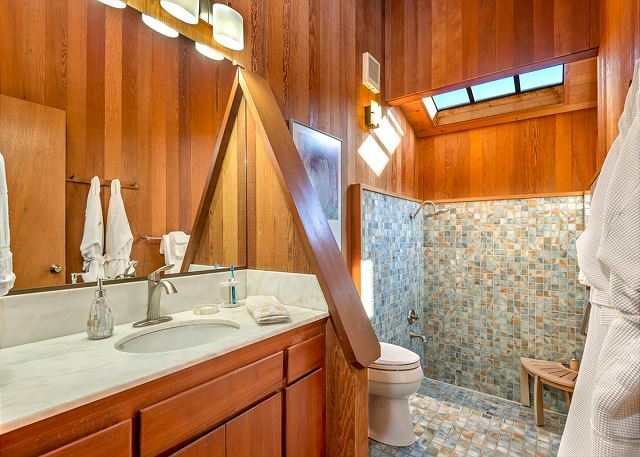 When you see the pictures of this property online, don't worry, the home is exactly as shown. 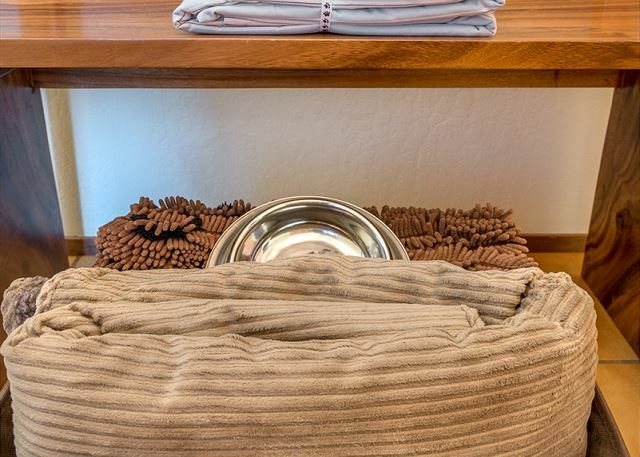 The home has been kept up and was extremely clean, especially for being a 'pet friendly' home! Location was perfect. The beds were comfortable. The outside patio was very relaxing. The deer around the house never failed to entertain us. Like I said, just a wonderful, relaxing week in Sea Ranch! We'll be back for sure! We've had another wonderful stay at this location and this is our 4th time. The view is spectacular. We will be back again. This was our second stay at Abalone Bay and we plan on going back soon. 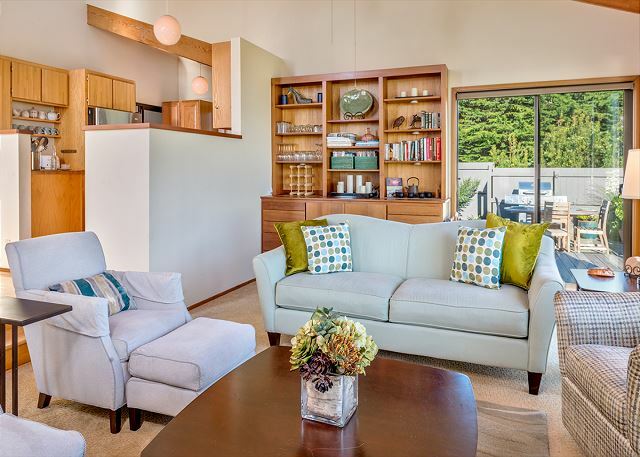 The location is ideal, approximately 100 yards from the coast. 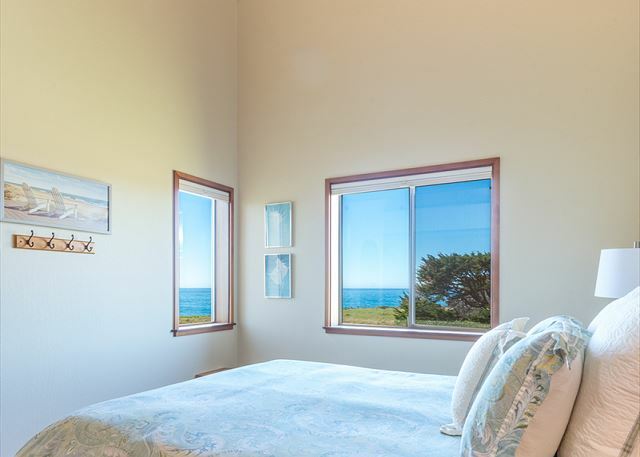 The view is unobstructed from the house and there are large scenic windows in the living room from which to enjoy the ocean and wildlife yet privacy prevails. The house and accommodations are outstanding. 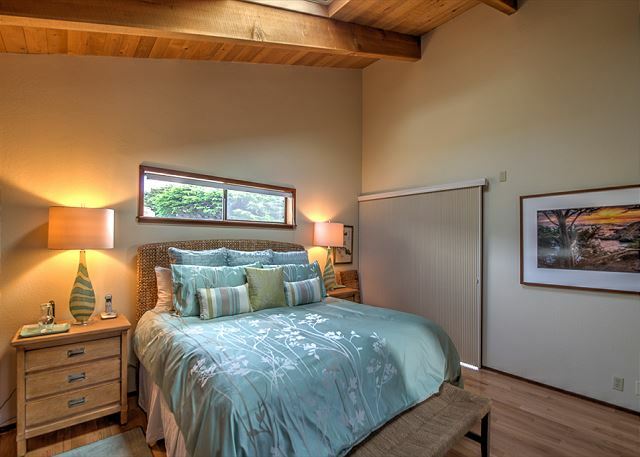 Very comfortable house with many comforts and conveniences of home, but on the Pacific coast! The owners obviously want guests to be very comfortable and we appreciated it! We loved staying at Abalone Bay and can't wait to return next year! Beautiful home, great views, really comfy. This is a perfect place to relax and enjoy nature and family. It is also a great spot to explore from. 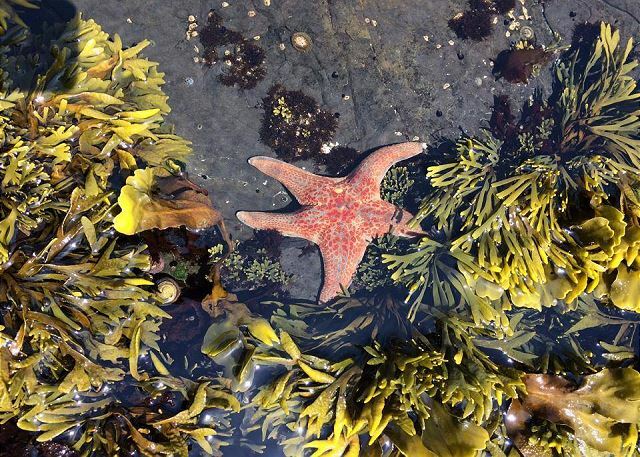 Tide pools are out the back door and fun shops, historic sites and great hiking are only a short drive away. 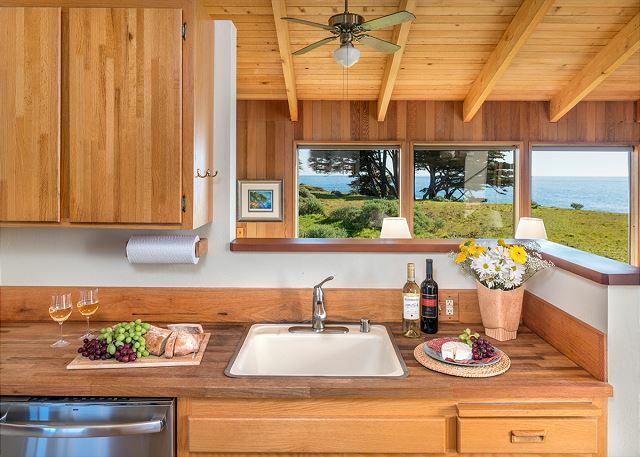 The kitchen has every thing a serious cook needs including a great view. The Abalone Bay home is stellar in every way: location, design, comfort, thoughtful touches, amazing kitchen with fabulous appliances, supplies and dishes, spectacular master bath rain shower, comfy beds, ample living room family seating, great for dogs, lovely garden, private hot tub with a view, many lounge-worthy Adirondack chairs, soaring ceilings to match the soaring views, ocean soothing sounds, bedrooms with views, great washer dryer, close to walking paths, hop-skip-and-a-jump to a harbor seal haven- not to mention nice linens, white towels (you KNOW white towels are better to wash and easier to keep clean!) and a bottle of good wine and a note of greeting from the owners upon arrival. Oh yes, and chargers by the beds for devices, a huge TV, nice battery candles for ambiance, Riedel wine glasses and also a stunning array of plastic stemware and dishes - well, we had a wonderful time! The love of their home by the owners is very evident. This is not just a rental house; this is a rental home. Appreciated the one hour late check out that was allowed by the agency and worked with the cleaning schedule. Also appreciated being able to arrange to leave the keys and welcome packet at the home instead of returning all the way north to agency in Gualala. Would love to return for our annual Sea Ranch escape next October; note that the family has blocked out most time from August on to the end of the year for projects and such there. Fingers crossed that something will work out for 2018; definitely will keep in mind for future. Owners are very active on Instagram, Twitter and Facebook so I feel like I have a social connection with a lovely family via the Ethernet. Their appreciation of photos taken at their lovely home is a very nice bonus. Thank you Jorge and Donna Martinez! Loved this place! 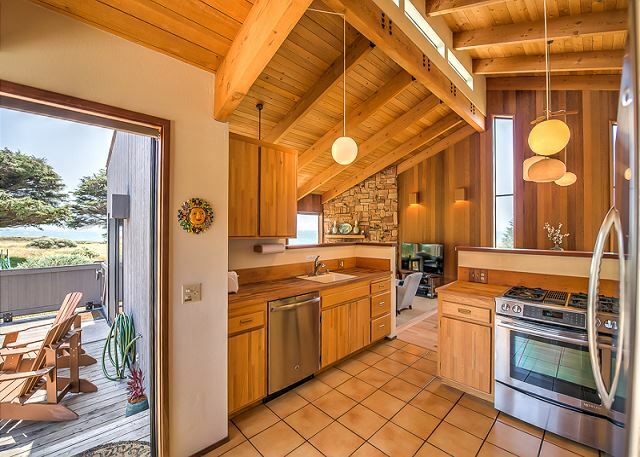 It has an amazing view and is 50 ft from the ocean. 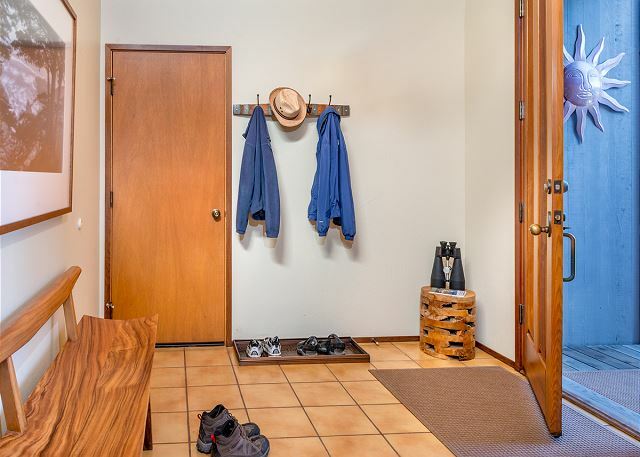 The home has an open floorplan and is very nicely decorated. It's very clean and comfortable. The owners clearly have great pride of ownership and they care about your experience. We really appreciated that it's pet friendly. Very few good properties in the area are. We really enjoyed walking the trail along the cliff steps from the house. Deer and foxes showed up regularly. A beautiful respite! Beach Rentals was great. Rarely is a vacation rental as advertised, there is always some exaggeration. In this case I think it is fair to say that there was perhaps some understatement! 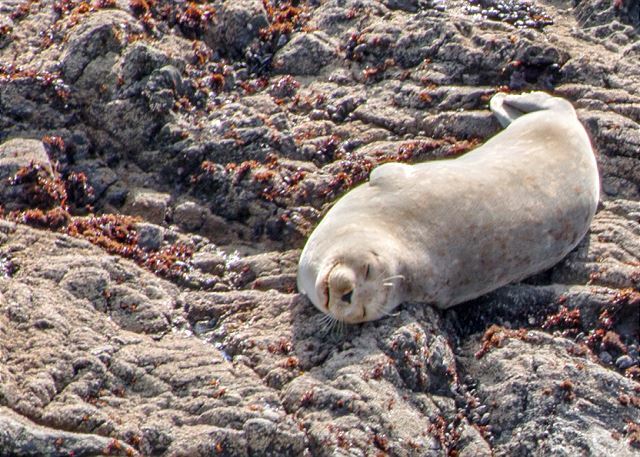 Walking along the bluff top every morning, saying "Hi" to the harbor seals that live at the foot of your garden, seeing a whale swim by blowing salt water into the air and waving his tail fluke at you before diving. Simply amazing place. The end of August seemed like a perfect time to visit as we loved the coastal temperature when just a few miles away folks were melting. And all of that is just the location! The house is very well kept, clean and presented, we slept like logs, drank too much wine we acquired on our visit to the vineyards (nice 90 min country drive), ate well on food from Gualala stores (particularly liked Surf Market). 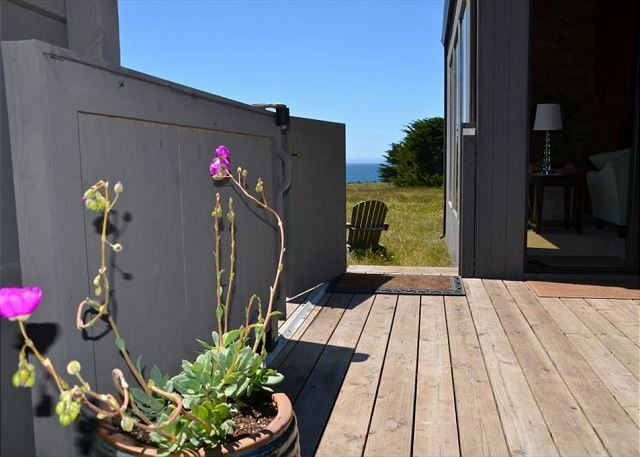 We wanted peace, quiet, relaxation and great walking and we got that and so much more in and around Sea Ranch. Everything you always wanted, and more! Beautiful house; clean, well-appointed, ocean views and easy access. The stars at night were incredible - Milky Way like a brush stroke across the sky. Appreciated the extra dog friendly amenities like dishes, towels, doggie bags, and treat. Kitchen was a joy to use - tons of dishes, cookware, even spices. BBQ worked great and hot tub was wonderful, both located on the beautiful flagstone patio. Saw a hummingbird flitting around the blossoms. This well appointed house with its dog welcoming features was beyond our expectations in every way; right on the bluff, watching the whitecaps from the living room or the chairs outside, was a soulful and calming experience. 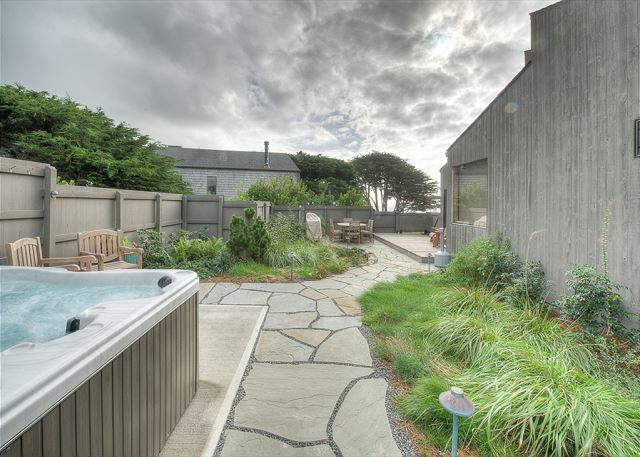 the large private fenced courtyard offered a wonderful hot tub and complete privacy from other houses nearby. The only jarring note was having a house so close to ours that there are notes necessary about where to walk and keeping the tv shaded. Overall we would consider this property next year too. This may have singlehandedly have been the best weekend getaway we've ever taken with family and friends. The house is impeccable. It doesn't really feel like a "rental" as the owner uses it for their own purposes throughout the year. Its as though you are staying at a dear friends house with beautiful furnishings and outfitted with all the things that you might need. The setting is UNBELIEVABLE! 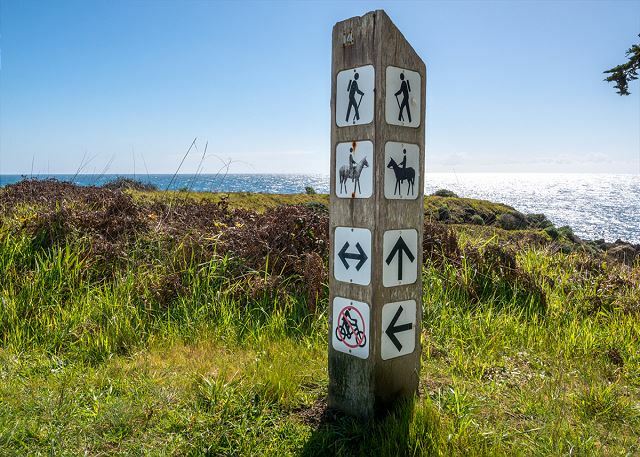 Sea Ranch is private and the trails can't just be accessed by the public. 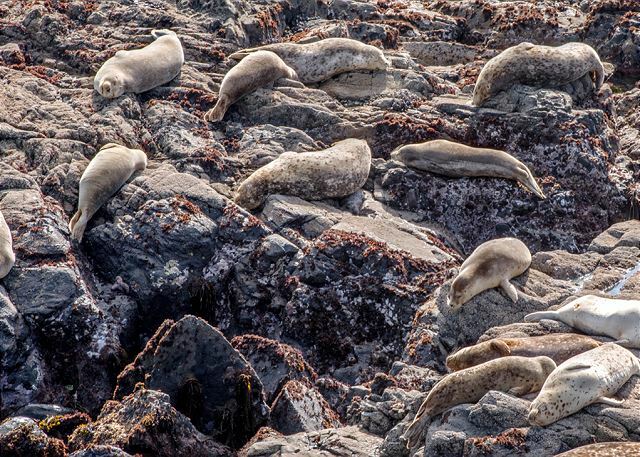 You are right on the coast with all the trails at your disposal, and directly above one of the seal Rookery's that are quite busy this time of year. We took long leisurely walks each day and went quite far both north and south. (we could have gone much farther if we'd been inclined.) the Trails seem endless. Its all of nature's beauty and wonder directly at your feet. We were in awe at our luck to have been able to stay here. Absolutely magical. Spectacular Property with spectacular view! 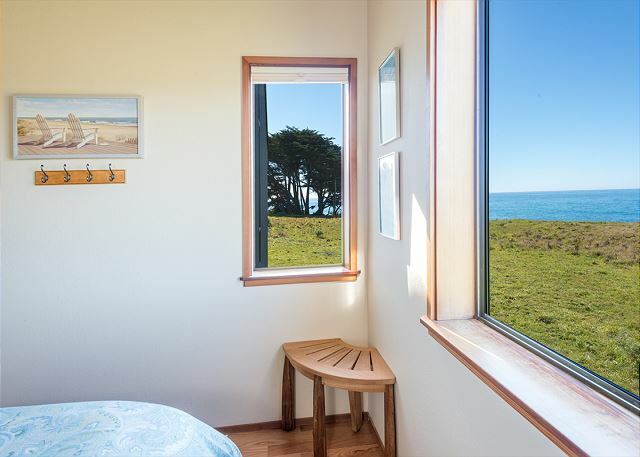 The property has a spectacular view of the ocean. We saw the whales migrating 5 times while we were there (once from the kitchen)! We love the yard, spacious and well-maintained. Our 2 dogs also loved the yard and the treats as well. The kitchen could be more updated. The oven didn't work very well. Other than that, we loved the property. Will come back again. Entering the Gate, we knew our stay at Abalone Bay was going to be a special experience. The home is stylish and comfortably furnished. Other than your food/drink, clothes and toiletries, there's nothing you would need that isn't provided at the house. A welcome note and bottle of wine was a thoughtful gift. The topping for our experience is how Jorge & Donna went out of their way to make our family dog feel welcome. A special note addressed to Mylo, a treat, toys, dog dishes a blanket, towel and mat. The view is amazing!! We watched whales feed from the front room chairs. The walking trails were all we needed for entertainment. We definitely would love to schedule a return trip in the future. LOVED our stay! The Property Management is a plus, too! Very kind, and professional. We loved our time at Abalone Bay. The house is perfectly situated and super comfortable. Views are outstanding! Abalone Bay was everything we could have expected. Each morning we woke up to the most exquisite view. The house is so well designed with everything we needed, especially the kitchen. We celebrated Christmas there with our family so we did lots of cooking, even baking, and all the equipment was there. We thought the location was perfect. Walking the trail along the ocean, checking out the tide pools, and watching the seals were our favorite activities. Oh yes, and the hot tub at night under the stars! Several houses near each other with ocean views set the restorative tone for a weekend of team bonding and company planning for the fast approaching new year. Each house was clean, cozy and inviting which delighted everyone in our group. A perfect setup for a weekend get-away. The home is exactly how it's described on the website. We appreciated that the home is in good condition as well as the personal touches that add to the overall appeal.The owners seem to be very genuine and generous in their approach to renting out their home. It seems more like a friend's house and less of a "rental." A great week, even with the rain. Beautiful setting! Beautiful house! Had a great time and wanted for nothing. We had a wonderful time at Abalone house. The kitchen was well stocked and the attention to detail was great. The house was in a great location right near the water with a great walking trail. We saw seals, dolphins, baby quail near the window and deer. Very peaceful and relaxing stay. Thank you for making our vacation a great one. 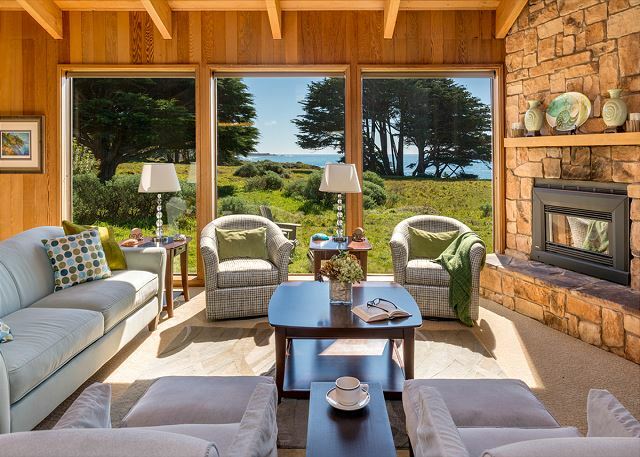 Another of our annual escapes to Sea Ranch - First time at Abalone Bay, very pleased with the location and condition of the house. Has everything you need. 11 days of relaxation for us, great fishing for our grandchildren. A beautiful home with thoughtful amenities and details and everything worked! We loved it! Good instructions and suggestions from the homeowner in the house binder. The home is well maintained and very clean. Hats off to those who are doing that work! Beach rentals was great, as usual, friendly and efficient. Recommend St Orres for dining at either the restaurant or bar. The Surf market has pretty much everything you might need and very helpful folks. Good wine selection. Lots of organics and local organic produce, not to mention the local organic gelato from Pazzo Marco Creamery. 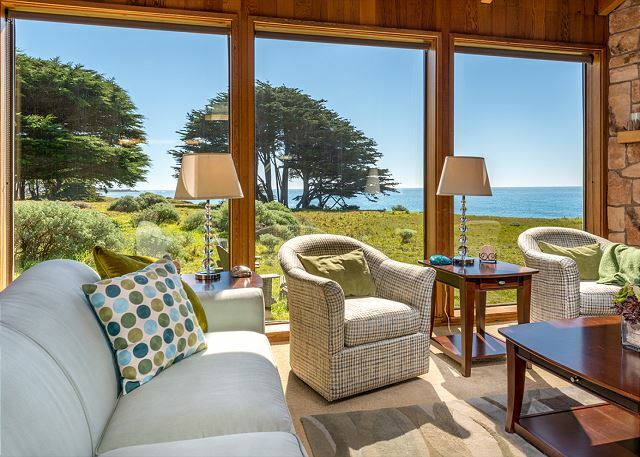 Abalone Bay is a lovely, well-maintained house with wonderful views. The location is perfect--an easy walk to the lodge. Outside, enclosed deck is perfect spot for relaxing or for an alfresco meal. 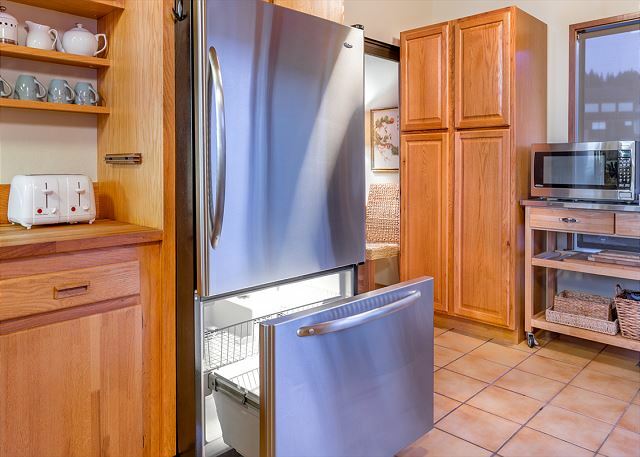 Kitchen is very well equipped so you can easily prepare a holiday meal. We had a great Thanksgiving with six adults and two dogs. My family has been coming to the Sea Ranch since 1974; this was our 27th visit. 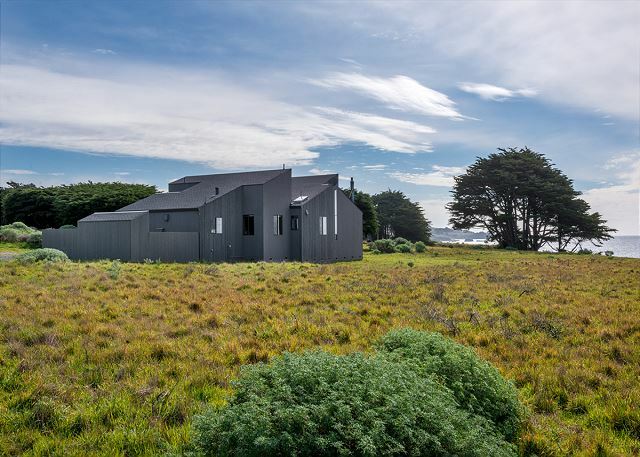 Of all the other residences I'd have to say that the Abalone Bay house was probably the best equipped, maintained and located of all of them. 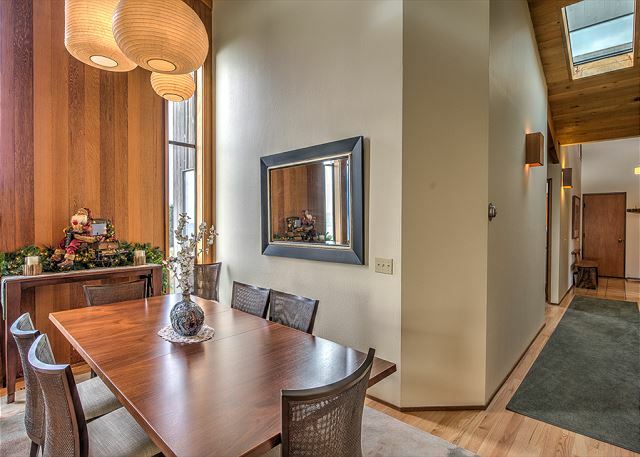 Beautiful home, exactly as described, with plenty of space and the bluff trail as your backyard. Deer and other wildlife wandered by our living room windows every morning. We can't wait to go back. 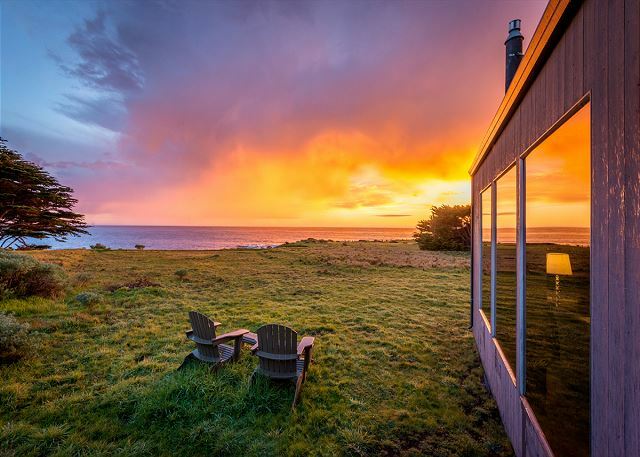 Three wonderful nights by the ocean, just yards from a seal sanctuary. 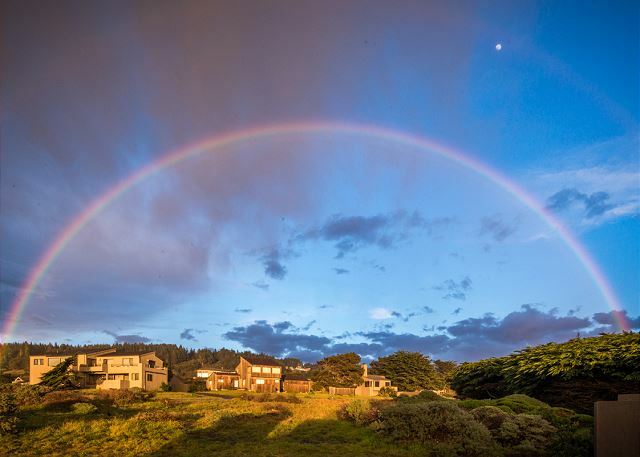 My wife and I spent and incredible three days at Sea Ranch (12-15 March 2015). Abalone Bay was everything we hoped it would be and more. 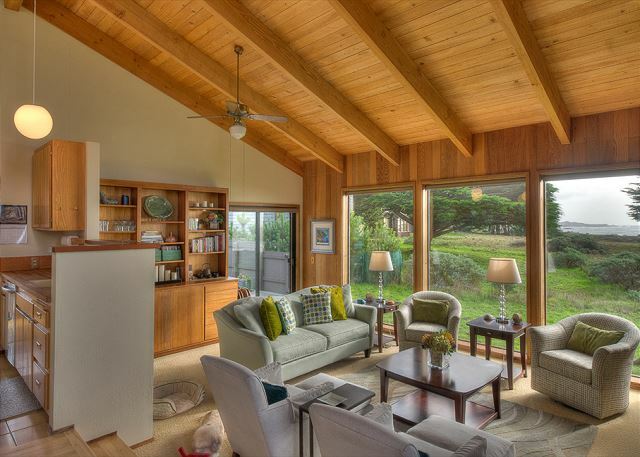 Great location, right on the coast with a beautiful and uninterrupted view from the living room. The furnishings and accommodations were five star, perhaps the nicest we've ever stayed in. A great fenced in yard (with hot tub) for the dog. 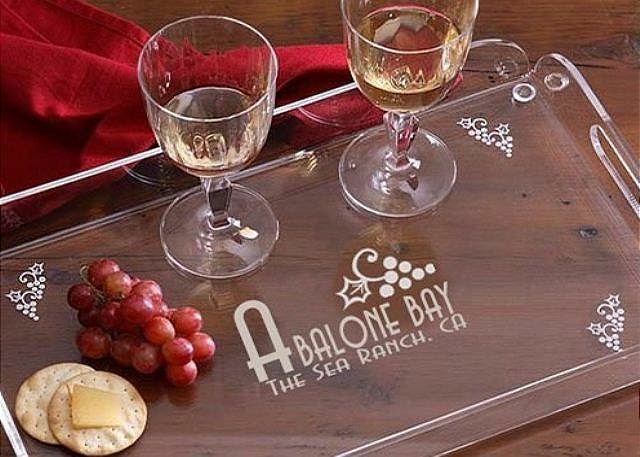 We will definitely plan on returning and will work or stay around the availability of Abalone Bay. Would highly recommend this home to anyone without reservation. The staff at Beach Rentals were great, very professional and helpful. They went out of their way to be of assistance. Thanks to the owner for sharing their home with us and to the staff for their kindness. 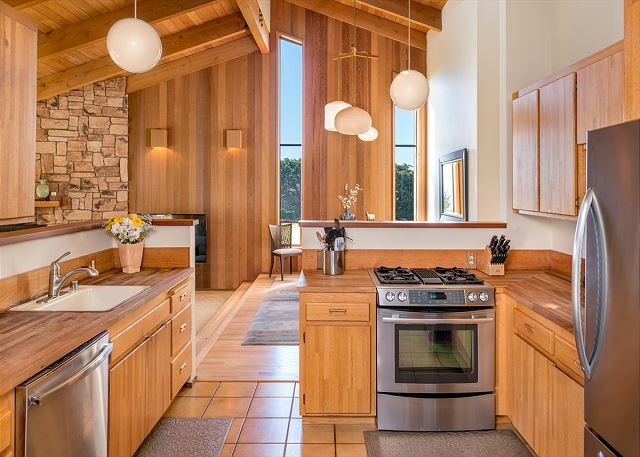 Beautifully appointed and maintained home overlooking the bluffs of Sea Ranch. Perfect for our group of three couples. We enjoyed hiking, reading cooking and watching the many whales from the property. The owners are pet-friendly and our labrador thanks them, too! Abalone Bay is tops for us! 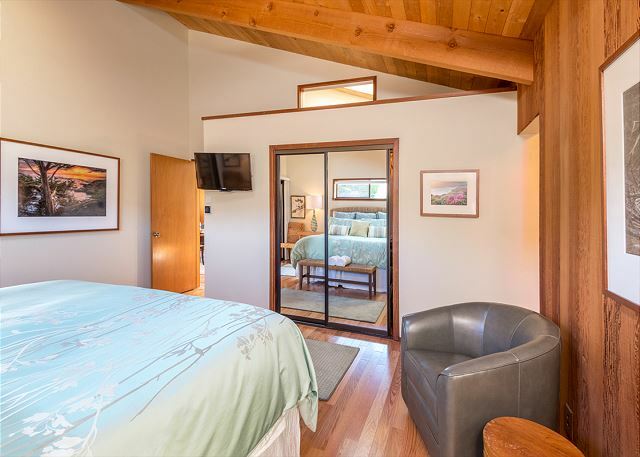 Fantastic stay in beautiful home near the coast close to a Harbor Seal Sanctuary! Clean, well designed home with lovely backyard with gas BBQ and hot tub, and deck. Sheets and towels provided. Flowers in a vase with wine glasses on a tray and a welcome note from the owners. Highly recommend this beach rental. Beach Rentals most helpful and with a smile! Super nice place fully stocked with everything, including towels and protective sheets for my dog who likes to plop on couches and beds. Peaceful, quiet location allowed me to catch up on sleep and nice hiking trails (minus the holes (gophers?)) kept me the and pup exercised. Gave me some great ideas for a beach house of my own some day. Abalone Bay is a great home. We enjoyed a perfect week of weather while we stayed at Abalone Bay. The home was comfortable, well appointed and completely met our expectations. We appreciated the "accommodations" for our dog complete with a sleeping blanket, numerous dog towels and pick up bags. We would highly recommend this property and Beach Rentals to all of our friends. Thank you! 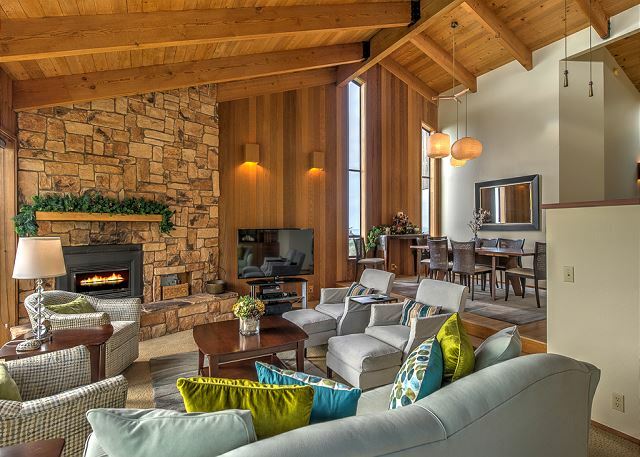 The Abalone Bay home is a fantastic home for a beachy worry free vacation! 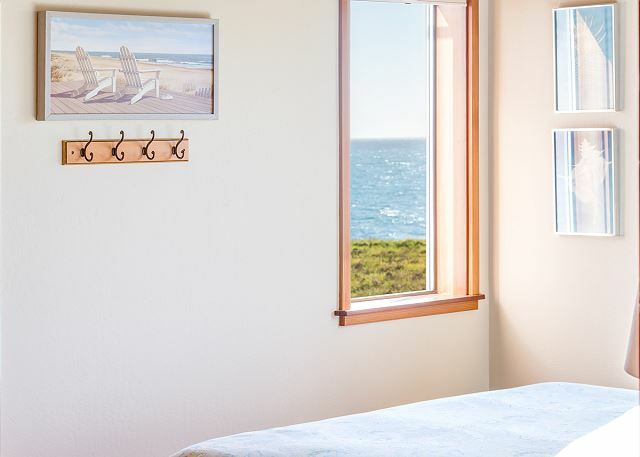 The welcoming furnishings, the lush linens, the spa master suite, the relaxing hot tub, the fully stocked kitchen and the amazing ocean view all make this beach rental first class. It is very easy to entertain and relax in this home. Many nights we cooked dinner while the cool ocean breeze filled the home. We watched movies on the large flat screen HD tv and settled into the comfy furnishings. We enjoyed playing cards with English afternoon tea and music by the fire with cocktails. The proximity to walking trails and beach access is wonderful. We enjoyed long morning strolls with picturesque nature views full of wildlife. The proximity of the home to The Lodge for a fantastic meal and to Gualala for shopping and groceries quite easy. 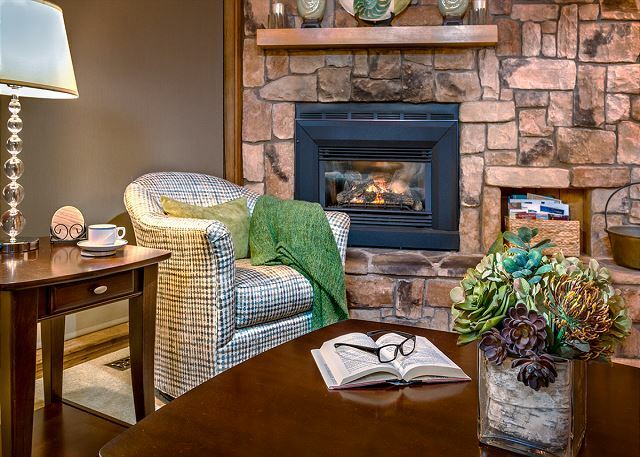 This home is perfect for couples or families alike. Even our dog was pampered, enjoying her own welcome kit. The fully enclosed yard makes it easy to monitor pets and children. 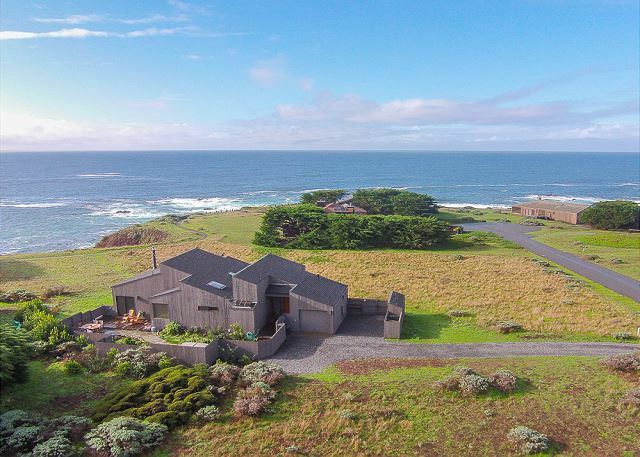 We have rented many homes at The Sea Ranch and this home tops our list for comfort, amenities, furnishings, entertainment and luxury. We had a beautiful vacation. We will book again and recommend this home to our family and friends. Relaxing with stunning views from this vacation home. Well equipped for family of three. Loved the courtyard garden. My Partner and I took our three girls to this house and loved it. The amenities were awesome, the nature activities were great and the space was perfect for the 5 of us and dog. You will not be disappointed! This place was clean,well maintained ,and comfortable. It had a great view all the amenities you would want. We rented 2 houses in the same neighborhood and had such a wonderful time. We must have seen 20 whales, just from our living room weekend. Kitchens were amazingly stocked, house was clean and homey. Would definitely come back. Just as beautiful as pictured online. We loved our (unfortunately) brief stay here. Next time will plan to stay longer! My family and I (including our beloved dogs, Gracie and Molly) spent 5 days over Christmas at this beautiful spot. The accommodations were excellent, the beds and furniture beautiful and comfortable and the setting was spectacular. I would highly recommend Abalone Bay for your next Sea Ranch vacation - and if you have dogs you MUST bring them!